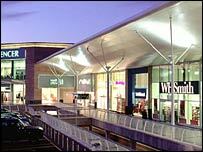 Concerns have been raised over plans to reopen a £200m out-of-town shopping centre which closed over safety fears. The Castlepoint Centre was shut on 1 December over worries that the concrete in the car park was unsafe. The Castlepoint partnership is planning a phased reopening on 19 December, with 1,000 spaces available initially. But Bournemouth Borough Council is worried that there will be traffic problems if all the 2,975 car park spaces are not available. A council spokeswoman said: "We are very concerned about the traffic implications of a partial re-opening. "Also, we have not yet been given enough information about the structural problems to be confident about the safety works. "The planning conditions are quite clear that 2,975 car park spaces must be available at all times the centre is open." In a statement Castlepoint partnership said it "continues to work closely with Bournemouth Borough Council on other contingencies such as park and ride schemes". A spokesman said: "The decision we took on 1 December was very difficult from a commercial point of view, but from the health and safety point of view it was very easy. "We will not compromise on safety."